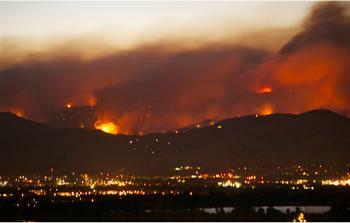 BOULDER, Colorado, September 7, 2010 (ENS) – The worst wildfire in Boulder County history is blazing uncontrolled in rugged, steep terrain west and northwest of the Boulder City limits. While no deaths or injuries have been reported as a result of the fire, 92 structures have burned down, eight others are damaged, and 500 more are threatened. The fire began on Monday in Emerson Gulch located in Four Mile Canyon about five miles west of downtown Boulder, a university town in the foothills of the Rocky Mountains. By Tuesday afternoon, the Fourmile Canyon wildfire had grown to at least 7,100 acres in size and forced the mandatory evacuation of more than 3,500 residents living in the steep, heavily forested hills west of the City of Boulder. More than 200 firefighters from at least 35 local, regional and national agencies are struggling to contain the fire feeding on a forested area heavy with dead and down trees ravaged by mountain pine beetles. Eight air tankers and three helicopters joined the effort Tuesday. Due to a thick inversion layer limiting visibility, air tankers were unable take off Tuesday morning, but dropped more than 90,000 gallons of fire retardant later in the day. Teams have been on the scene all day cataloging burned structures and investigating the fire’s cause and origin, which are still unknown. Boulder County Sheriff Joe Pelle said Tuesday afternoon that investigators are checking whether the fire was caused by a car striking a propane tank. Pelle toured parts of the burned area Tuesday with Governor Bill Ritter and reported that about 1,000 people living in 70 subdivisions northwest of Boulder have followed evacuation orders and left their homes. Affected communities include Four Mile Canyon, Sunshine Canyon, Gold Hill, Sugarloaf, Pinebrook Hills, and Boulder Heights. A few residents declined to leave their homes. No evacuations have been ordered within the Boulder City limits. Governor Ritter today issued an emergency disaster declaration for the Fourmile Fire, authorizing $5 million in state aid to help pay firefighting costs and directing the state to seek additional funds from the federal government if necessary. “On behalf of the people of Colorado, I want to commend the emergency crews, including those who have lost their own homes, for doing all they can on the fire lines to protect life and property. While it is encouraging that the evacuations have been successful and there have been no serious physical injuries, there will be many struggles ahead as we begin to assess property damage and losses,” said Ritter. “The Fourmile fire is a harsh reminder about the importance of being prepared for wildland fire, particularly for those who live, work and recreate in the wildland-urban interface,” said Jeff Jahnke, state forester and director of the Colorado State Forest Service, the state’s lead agency for wildfire preparedness. City Manager Jane Brautigam has ordered the closure of Boulder Reservoir to the public starting at 5 pm Tuesday, until further notice. The city property is being used to shelter firefighters and emergency crews who are working the Fourmile Canyon wildfire. The public will not be allowed access to the Reservoir during this time. This includes pedestrians, bicyclists and all vehicles through all entry points. The Boulder Reservoir location was chosen because of its proximity to the Incident Command Post at the Boulder County Regional Fire Training Center. Xcel Energy estimates that some 2,000 customers are without electricity in the Fourmile Canyon fire area. As the fire grew on Monday, crews shut off service to sections of the distribution power grid to reduce danger. Xcel now is attempting to gain access to the fire zone in order to ensure gas service is shut off, to assess the damage to its facilities, and to begin restoration. The Fourmile Canyon Fire does not represent a threat to the University of Colorado and campus classes are proceeding on a normal schedule, the university said in a statement Tuesday. However, some students have been displaced from their off-campus housing and others may have been or will be affected by smoke or other impacts from the wildfire. Students who need assistance with temporary housing should contact Housing at 303-492-6494 for assistance or if permanent/long-term housing assistance is needed contact the Red Cross at 303-722-7474.